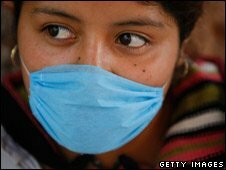 Mexico appealed for fair treatment towards its citizens and products, as health officials there said the swine flu outbreak could be stabilising. A minister hit out at countries barring flights from Mexico, while another appealed against restrictions on pork. Mexico has now confirmed 19 fatalities from the virus, which is now present in 18 countries around the world. But Health Minister Jose Angel Cordova said it appeared that the outbreak could be levelling off. "Each day we're seeing fewer serious cases and therefore the mortality rate is dropping," he said. Did Mexico over-react to flu? On Saturday South Korea, Italy and the Irish Republic became the most recent countries to confirm cases of the swine flu virus. Globally more than 700 people are known to be infected. Person-to-person transmission has been confirmed in six countries. But in cases outside Mexico, the effects of the virus do not appear to be severe. A top World Health Organization official said that there was no evidence of the virus spreading in a sustained way outside North America. "I think it would be, at this stage, unwise to suggest that, in any way, those events are out of control or spreading in an uncontrolled fashion," said Dr Michael Ryan, the WHO's director of global alert and response. "I think the next few days will tell as this develops," he said. In Mexico, Mr Cordova said that the flu outbreak appeared to be stabilising. "It would still be imprudent to say that we're past the worst of it but I do think... we are in a stage of stabilisation," he said. On Saturday, authorities cut the suspected death toll by 75 to 101, as more test samples were returned. Mexican Foreign Minister Patricia Espinosa criticised five nations - China, Peru, Argentina, Cuba and Ecuador - which have cut flights to Mexico. "We're surprised by the adoption of unjustified measures," she said. She also urged Mexicans to avoid travel to China, accusing the government of placing a number of Mexican citizens in unnecessary quarantine in three Chinese cities. Mexico has also - together with the US and Canada - appealed to those countries which had banned pork products. Decisions should be made based on scientific evidence and not create "unnecessary trade restrictions", a joint statement from the three countries' agriculture ministers said. The WHO has also cautioned against flu-linked restrictions on pig products.